Happy New Year! 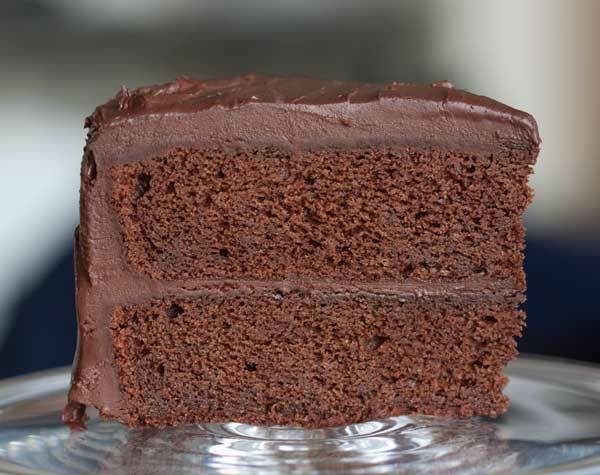 To celebrate, here’s a chocolate honey cake recipe to add to your ever-growing chocolate cake collection. Adapted from a recipe in Fine Cooking Magazine, this chocolate honey cake is sweetened not only with honey, but two kinds of sugar. In addition it includes a combination of oil and butter, plus sour cream for moisture. All those things plus a fairly simple chocolate-honey ganache make it one of the best chocolate cakes we’ve ever tasted. If you have two 10-inch round cake pans, I recommend clicking over to Fine Cooking and using the recipe on their website. My issue was I only own 6,8 and 9-inch round pans, so rather than make the whole recipe and bake some of the excess batter in cupcake cups, I scaled the recipe down to fit two 9×2 inch cake pans. It worked perfectly and we still had a pretty large cake. In the future, I might cut Fine Cooking’s original 10-inch chocolate honey cake in half and bake it at a lower temperature in a 9-inch round springform pan or maybe even make a half batch in a loaf form, then split and ice with ganache. Either way, I’m already looking forward to making this one again and we haven’t even finished it. This cake is pretty simple, but since the ganache takes several hours to thicken, you may want to make the ganache first and then start the cake while the ganache sits. Preheat the oven to 350 degrees F. Grease two 9x2 inch round cake pans and line bottoms with parchment paper rounds. Dust sides with flour. Sift cocoa powders into a medium bowl. Whisk in the hot coffee and then the honey. Let cool completely. With an electric mixer, beat the butter on medium speed until creamy. Gradually add the oil, beating until combined. Add the brown sugar and granulated sugar. Raise the mixer speed and beat until light and fluffy, about 3 minutes. Add the eggs one at a time, beating well on medium-high speed after each addition. Add the sour cream and vanilla and beat just until combined. Using a heavy duty scraper for stirring (or the lowest speed of your mixer if using a stand mixer with paddle), add the flour mixture and cocoa mixture alternately, beginning and ending with the flour, scraping down sides as needed. Beat just until combined. Divide the batter between the two pans, spreading evenly. Tap pans lightly before placing in the oven. Bake on center and lower racks, rotating the pans halfway through, until a wooden skewer inserted in the center of each cake comes out with only a few moist crumbs clinging to it, 40 to 45 minutes (mine was done in 40). Cool the cakes in their pans on a rack for 10 to 15 minutes. Run a knife along the sides of the pans, invert the cakes onto the rack, and remove the pans and the parchment. Let cool completely. At this point, you may also wrap the cakes in plastic and freeze if desired. Combine the heavy cream and honey in a 2-quart saucepan. Stir over medium-high heat until the honey dissolves into the cream, about 30 seconds. Just as the cream comes to a simmer, pour it over the chocolate. Let stand about 1 minute; then whisk until smooth. Stir in the butter, and vanilla until the butter is melted and the mixture is glossy. Set one of the cake layers on a serving plate. Spread about 1 cup ganache over the surface of the cake. Top with the second cake layer and spread a very thin layer of ganache over the top and sides of the cake to seal in any crumbs. Refrigerate for 5 to 10 minutes to allow the crumb coat to set. Spread the remaining ganache evenly over the top and sides of the cake. Note: Makes sure your cake pans are at least 2 inches high. For the chocolate, I used a mixture of Ghirardelli bittersweet chocolate bar and bittersweet chocolate chips and didn’t have any issues. I also cheated a little and after the ganache had cooled, I chilled it just until it started to thicken. If you have time to let it cool at room temperature, that’s probably the best way to go. Thank you for scaling it down too. Who owns two 10 inch round cake pans? This is far more realistic for most home bakers. Your cake looks delicious. I too have a hard time imagining honey in chocolate cake but I totally trust you that it’s worth making! I love all the questions and answers in this thread. This looks amazing! I will definitely try this one. There are enough other ingredients in the cake to offset the sugar and honey so in my opinion it’s not too sweet. It’s about the same level of sweetness as an average chocolate cake, so going buy your scale I’d give it about a 6 in sweetness. Maybe even a 5. It’s sweet, but sweet in the way chocolate cake is suppose to be sweet and not at all cloying. I don’t see it in your description so I have to ask where would you rate the sweetness level on a scale of 1 -10 (high end being too sweet to eat) given the honey plus two sugars? Heidi, I don’t think the ingredient list is as bad as it looks since a lot of things are just “the usual”, but I do question the use of two kinds of cocoa powder. The cake was wonderful, but next time I make it I might try it with just Dutch process. Since there’s already so many acidic ingredients in the batter, it seems like a good Dutch process would be fine. As for the texture, it’s not really that heavy. It’s dense and soft, but less heavy than I thought it would be. You can definitely taste the honey. Gosh….so many ingredients for a chocolate cake! It takes a little bit from all my favorite recipes. What flavor difference does the honey add?? I can’t imagine honey in chocolate cake. Looks wonderful. I might have to try. What’s the texture like? It looks kind of dense and heavy. This looks delicious! I’ll have to make it soon – chocolate cake is one dessert everyone here will eat! !